It took weeks of searching and researching, but Hotel Harrington ended up as our DC home away from home. 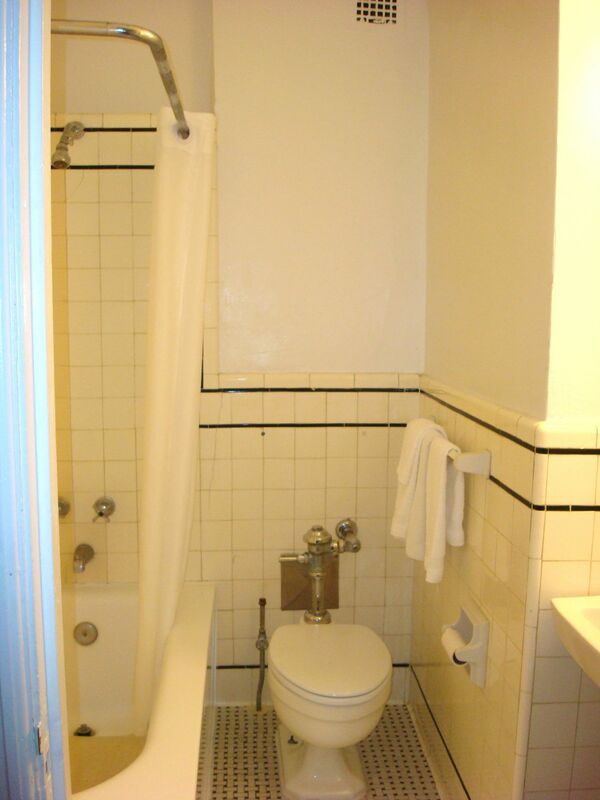 I first booked us a hotel in Shady Grove, Maryland, on one end of the Metro red line, and then I switched us to another place (with better reviews) not far from Mount Vernon, about three(!) miles from the last Metro stop on the yellow line. I still wasn't satisfied. I asked for advice, but the places people recommended were all booked. Then I found the Harrington. Even though it wouldn't have killed us to stay in the suburbs and take the train in every day, I really didn't like the idea of spending so much of our time in transit. 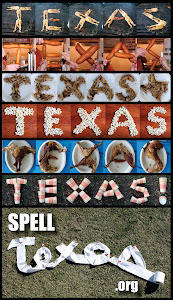 By staying downtown, we were within walking distance of almost everything! We were a block away from Pennsylvania Avenue, and just a few (long) blocks from the National Mall. Ford's Theater and the Hard Rock Cafe were right down the street. Most places that close to everything are pretty expensive, but this one was fairly reasonable. (OK, expensive enough for us to REALLY evaluate the cost, but for most travelers, not expensive at all.) Of course, you get what you pay for. 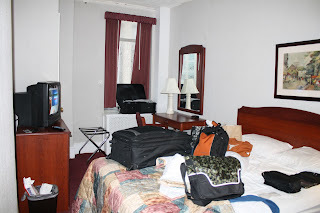 We were paying for location, location, location, so the room itself was not at all fancy. 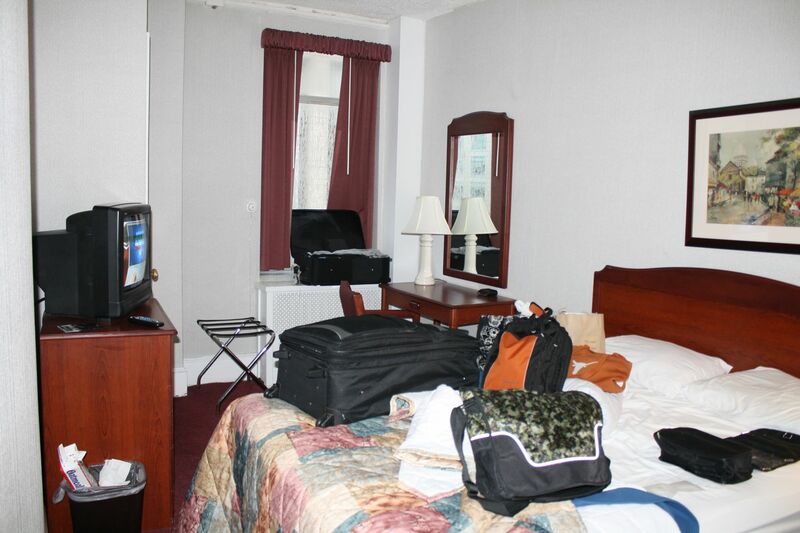 Here's our bedroom: a queen bed, little TV, little desk, very little room for getting around. And here's our little bathroom: old tile, small tub, tee-niny vanity. So here's the deal: This place is not for everyone. There's no pool or free breakfast. It's also headquarters for lots of big tour groups, so that can be a pain. For another, it's old! 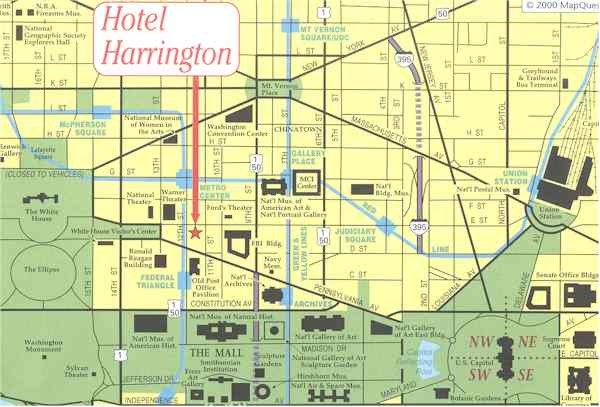 Open since 1914, the Harrington claims to be the oldest continuously operating hotel in DC. And it shows! Dingy wallpaper and carpets, odd smells. But to us, those things made it quaint, not run-down. I'm already trying to figure out how or when we can get back to DC, and I doubt it's going to happen while the kids are still at home. But if it does, I know where I want us to stay!